Unit 6 at Elm Lodge Bright is our One Bedroom Unit and has a queen and a single in the bedroom and 2 singles in the lounge, bathroom with shower. 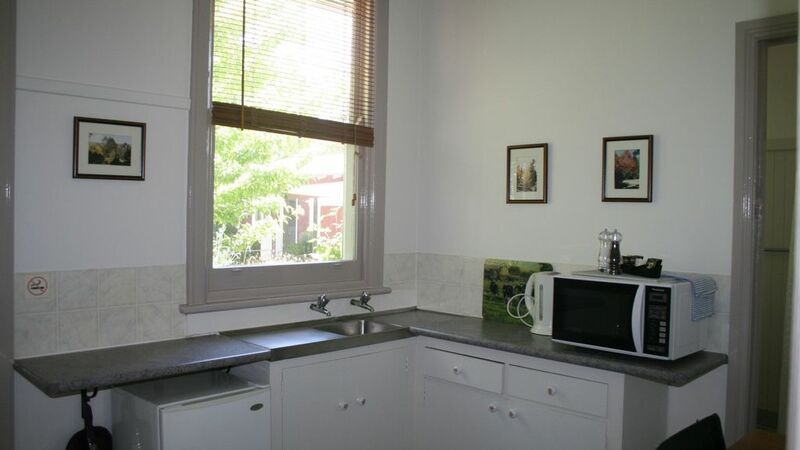 Kitchen has fridge, kettle, toaster, microwave, electric fry pan and electric sandwich maker, plus cutlery, crockery etc. Linen and towels supplied. Elm Lodge is perfectly located only 150 metres from the town centre of beautiful Bright in Victoria’s High Country. Elm Lodge has six self contained units, perfect for couples or families, with your choice of studio, one, or two bedroom units. For families we have our two bedroom rooms which can sleep up to 5 guests, or for larger families we can use rooms 3 and 4 which are interconnecting, together sleeping up to 8 guests. For larger groups the whole property can accommodate up to 26 guests. The large barbeque area, with large gas barbeque, tables and chairs, at the back of the units surrounded by beautiful gardens is the perfect way to relax and enjoy the tranquil beauty of Bright at the end of a day’s adventuring. Bike washing facilities and storage are available for mountain bike enthusiasts. Free off street parking in from of each unit and free guest laundry available including washer and dryer. Each of our units is listed separately on Stayzwith a separate availability calendar.